+​Our electromagnetic directional valve is used to control direction of flow. In particular, it usually applies for the hydraulic cylinder of mechanical device. Hydraulic solenoid valve generally consists of valve body, solenoid, slide valve, return spring, plunger, etc. +Block off out leakage, easily control inner leakage and safe to use. The system is simple in structure, easy to maintain, low cost. It is fast and lightness, and has micro power. Chance Hydraulic Co.,Ltd is a professional supplier, specialized in manufacturing and supplying hydraulic valves, pumps, motors, transmission parts as well as hydraulic spare parts etc. With a strict quality management system, advanced technical procedures, professional engineers and excellent after-sale services, we keep exporting the products to Europe, America, Australia, the Middle East, Asia and Africa, and win much praise and fame from the customers. Most of our products are jointly designed and developed with our foreign customers, so they are completely interchangeable with the famous brand, such as Bosh Rexroth, Vickers, Commercial, Sauer, Komatsu, Yuken, Tokimec, Caterpillar, SAI, Danfoss and Staffa etc. With competitive price, good quality, best service and prompt delivery, we sincerely welcome the opportunity to establish firmly co-operative relationships with customers in the near future. 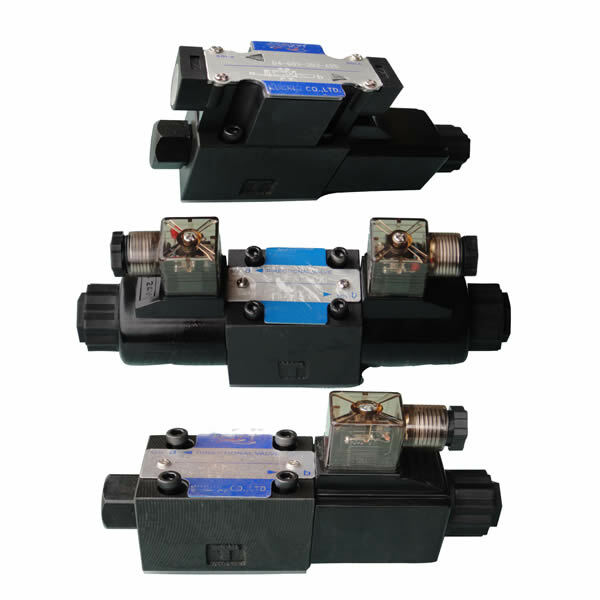 +Hydraulic valve electromagnetic directional valves are automated basic components used to control fluids and are actuators; they are not limited to hydraulic and pneumatic. Solenoid valves are used to control the direction of hydraulic flow. The mechanical devices in the factory are generally controlled by hydraulic cylinders, so solenoid valves are used. +Our electromagnetic directional valve is used to control direction of flow. In particular, it usually applies for the hydraulic cylinder of mechanical device. Hydraulic solenoid valve generally consists of valve body, solenoid, slide valve, return spring, plunger, etc.